The town of Castiglion Fiorentino is located in eastern Tuscany, between the cities of Cortona and Arezzo and bordering with nearby Umbria. It is perched on a small hill beside the valley of Chiana, belonging to the province of Arezzo, and it serves as a bastion, along with the towered castle of Montecchio Vesponi, of the small valley of Chio. By car: To reach Castiglion Fiorentino, both from Florence and from Rome along the A1 highway (Milan – Rome, also called ‘Autostrada del Sole’ in Italian), exit at Monte San Savino toll booth. Go right in the direction of Castiglion Fiorentino, which is reached after about 14 km following the driving directions. Road distances from Castiglion Fiorentino: Cortona 11 km, Arezzo 18 km; Perugia 62 km; Siena 70 km; Florence 94 km; Rome 211 km. By Train: The railway station of Castiglion Fiorentino is on the Florence - Rome railway line. The station is served by daily local trains. 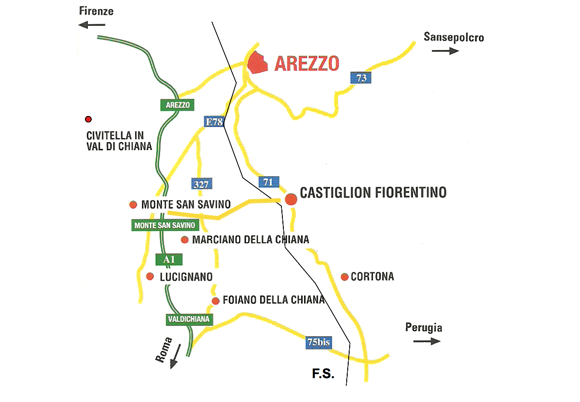 Intercity trains stop at the nearby stations of Arezzo (18 km) and Terontola (18 km). By Plane: The nearest airport is Perugia Sant'Egidio (San Francesco d'Assisi), which is located 95 Km away. As an alternative, the airport of Florence Peretola (Amerigo Vespucci) is 111 km away. Finally, the third airport in the area is that of Pisa (Galileo Galilei), which is 194 km away. If you have access to an ultralight, then you can land at the Serristori flight centre in Manciano, 5 km away.